33 1/2 x 96", 75hp engine, H.P. Rathburn & Son, Mill Point, ONT, 1876. Abandoned Windmill Point boneyard after being towed to Detroit from Chathem for possible repair. 1876 Chartered Torono Navigation Co.; ran general excursion trade off Toronto, ONT. 1877 - 78 Extensive repairs, Picton, ONT. 1878 Chartered Imperial Navigation Company; continued excursion trade. 1878 Went over Mill Dam due to broken rudder, 8 lost. 1883 Operated in Niagara area; new boiler & engine. 1899 Rebuilt & lengthened at Picton; 185.16 x 26 x 9.75'; 700.29 gross / 373.87 net tons; 3 decks, 1 mast; renamed ARGYLE, C94926. possibly repossessed by Hepburn later. 1908 Owned Lake Ontario Navigation Co., Picton. 1911, Feb.13 Owned Grimsby Beach & South Shore Navigation Co., Toronto. 1913 Operated as GRIMSBY unofficially between Toronto & Port Dalhousie, ONT; owned Margret Cook, Windsor, ONT. 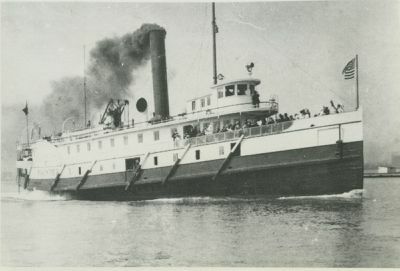 1915 Owned Peoples Steamboat Co., Chathem, ONT; operated between Chathem & Detroit, MI; owned Frontier Steamship Co.
1916 Sunk under Chathem bridge. 1918 Abandoned Windmill Point boneyard.